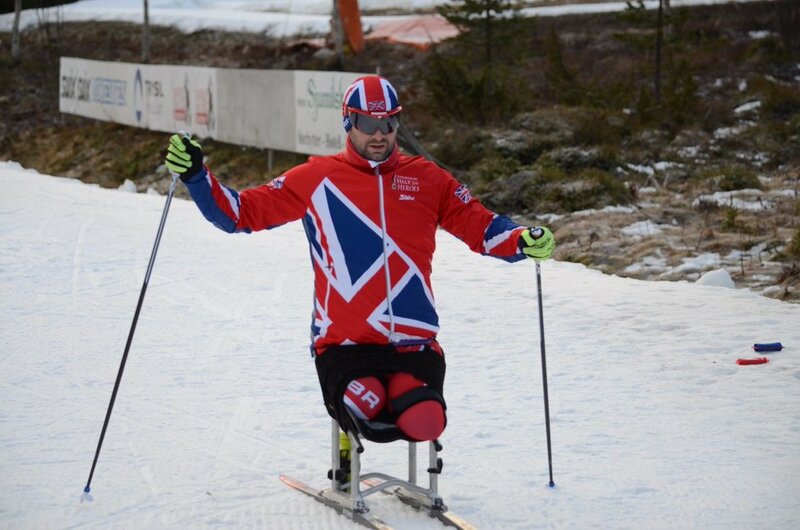 That’s it first Para Nordic World Cup of the 2018/19 season done and surprisingly it went pretty well considering going into it I felt like I was miles behind in my preparation and training due to a stop/start summer block. The Competition ran between 12th-19th Dec and consisted of 3 Cross country (CC) events (7.5k, 5k and the 800m sprint) and 3 Biathlon events (12.5k, 7.5k individual and 7.5k Classification start). My best result in the CC races was 17th in the 5k with 18th in the 7.5k and 22nd in the 800m which I am very happy with as I was only 18 seconds off the winner and 10 seconds off a top 10 and making the finals - A big improvement from last year. In the Biathlon I finished 11th in the 12.5k, 14th in the 7.5k individual and 13th in the Classification start which again are good results as shooting practice has been very limited this summer - it’s something the team as a whole need to work on if we are going to be up with top dogs in these events. The Team as a whole also performed really well. Scott kept up his great results from the Paralympic Games and is always mixing it up in and around the top 10 in all events. The new members of the team are holding their own against the rest of the world so Scott and I need to keep a look out as they are learning quickly. This can only be good for everyone as it will push us all to get better, get Great Britain up the ranks and start fighting for medals in the seasons to come. Up next is a short trip home for Christmas before we head off to Sweden for Round two of the season this will also be selection for the World Champs in February which is in Canada. So for me no eating too much Christmas pudding is a priority because the goal is to be fully fit for Sweden and make that team that will heading out to Canada to represent GB. The Competition ran between 12th-19th Dec and consisted of 3 Cross country (CC)events (7.5k,5k and the 800m sprint) and 3 Biathlon events (12.5k,7.5k individual and 7.5k Classification start). My best result in the CC races was 17th in the 5k with 18th in the 7.5k and 22nd in the 800m which I am very happy with as I was only 18 seconds off the winner and 10 seconds off a top 10 and making the finals a big improvement from last year. In the Biathlon I finished 11th in the 12.5k 14th in the 7.5k individual and 13th in the class start which again are good results as shooting practice has been very limited this summer - it’s something the team as a whole need to work on if we are going to be up with top dogs in these events. Up next is a short trip home for Christmas before we head off to Sweden for Round two of the season this will also be selection for the World Champs in February which is in Canada. So for me no eating too much Christmas pudding is a priority because the goal is to be fully fit for Sweden and make that team that will heading out to Canada to represent GB. Today we start our season with a World Cup competition in Canmore, Canada. The races are on from the 9th to 17th December and will consist of cross country and biathlon all various distances. I will be racing in 6 different events over the 8 days. We arrived in Canmore on the 30th November and our journey couldn’t have gone any smoother, we were treated like kings by the British Airways crew on the flight and even got an upgrade to business class which was a real treat. Thanks again Capt Norris-Worton and your crew for looking after the team. Training in Canmore this past week has been incredible the scenery is beautiful and we couldn’t have asked for better weather the only thing that has been little disappointing is the lack of snow but the organisers have had the snow machines on constantly and the venue is looking as good as if it was the real stuff. Over the weekend we had our first two cross country races, first up was the sprint race 750m. This is probably my worst event as I don’t class myself as a sprinter, it didn’t help that I crashed on the finish straight (yes, the straight about 20m from the line!) which meant I was out in the first round. Overall though I was happy with my race and know I have more to give next time in the sprint - all I need to do is stay upright! Sunday was the 7.5km middle distance race this race is on a 2.5km loop which you do three times, being my fifth race ever I was happy to come 27th setting a time which I’m fairly happy with. Yet again, I had a couple of falls losing me a fair bit of time but I also learnt I need to work a bit more on my right turns as it’s definitely my weaker side with a shorter stump. Next race is on Tuesday (15km cross country) then Wednesday is a rest day before the biathlon starts on 14th, 16th and 17th. So far the team has performed pretty well. Every one of us has stepped up our game from last season so we know the summer training has paid off so with the first two races this season under our belts. We know if we can find a few seconds here and there we will move up in the ranking, and make our dreams come true of being on that plane in March next year. On Sunday the 5th November the team flew out to Norway for our first snow training camp. Although over the summer months we’ve been able to train on artificial snow in a tunnel in Germany, there is nothing that compares to being outside in the fresh air having amazing views around you instead of looking at concrete walls. The selected training camp venue was town called Trysil it’s about an 1hr 45 min drive north east of Oslo. We arrived in Trysil quite late on Sunday evening so it was hard to tell how the ski tracks were going to be but we knew there was snow as we could see it on the verge as we drove. The next morning we woke up to an incredible sunrise and snow on the ground. The tracks were going to be good! Our apartment was about a 3 minute drive to the stadium area which had about 7km of well maintained ski tracks we couldn’t ask for better conditions to shake out and do our first 2hr session of the day. After training it was back to the apartment to stretch, eat, chill, throw banter at each other then get ready for session number 2. Being in Norway it gets dark by 1645 so our second session started about 1615 and finished in the dark which if you haven’t done it skiing through the forest with a head torch on in the dark is BRILLANT fun and very peaceful even if your heart rate is at 150+ due to the effort your putting in. Again, after training it’s back to the apartment to carry out the same routine as after the first session. This time though like most nights, our Coach (yes Coach!) cooks dinner and I’ve got to say he’s not made a bad meal yet, nice work Si. The rest of the week ran pretty much the same as day one, train in the morning, rest up then train in the evening rest and repeat. The weather on Thursday however was the worst I’ve skied in strong winds and lots of rain. To make it worse we were doing race day practice which was a 10km Cross Country race. Although it was horrible, it was also good to do as you need to train in conditions like that so if it does happen on competition day, you’re prepared for it. Friday was also a race day practice but this time we did a 7.5km biathlon. The weather had improved but the wind was still quite bad so shooting was a bit dodgy. I dropped a few shots but was fairly happy with how it went. During the week we also had a media crew with us from Help for Heroes and as media crews go they were very good they didn’t get in our way and worked with us so they did interrupt our training. Nearly all the footage and photos they took were done while we were training so we didn’t have stage anything thing and the interviews we did were done as quickly and as painless as possible. It wad like they weren’t there which is the best way with media I think so cheers guys. So after a great week on snow it’s now time to head home but not for long. On the 30th November the team heads out to Canmore in Canada for 8 days training before competing there in the first World Cup of the season and also our unofficial team qualifier for the Paralympic in March. All three of us are looking stronger and faster than last season and I believe we are in a good place to get the results we are all searching for and be the first Paralympic Nordic skiers in 20 years to represent ParalympicsGB at a winter games. But for now, it’s back to the gym lifting weights and sitting on a ski erg daydreaming about being on snow. So after a tough three weeks of training it was that time again to head up to Sterling for lab and Strength testing at the Scottish Institute of Sport. The lab testing looks at our vo2 max and also our lactate freehold, there are various tests we can do but this week’s were a set test - 3mins work, 1min Recovery, taking blood every 3mins until lactate hits 4 mils a 1km max effort test followed by 3 x 6 second effort. Sounds complicated but this is looking at power (wattage) and the final test is a 3km effort. All tests are carried out on a ski erg. I’m happy to say all results were an improvement on 8 weeks ago when I was last tested so all is moving in the right direction. We also had physio and nutrition catch ups to make sure the body and the engine are being looked after, again all was good there. Finally, the last testing we had was the dreaded Strength, the stuff I hate - to me it’s boring weights stuff. I know it’s an important part of the training and I do put as much effort into it as the Sking but I know I’m never going to enjoy it. The tests we had were bench press one rep (lift) max, followed by 50% of one rep max. Essentially all you do is max reps until you can’t lift anymore. Next was the same but bench pull followed by max pull ups and max dips. To my surprise all were a big improvement. I say that because I’ve lost weight over the past 8 week so I thought it might have effected my strength slightly. Next week we head off Norway to get on real snow for the first time this season with only a month to go before our first World Cup race in Canada. The week will be a good marker to see if the summer training has worked as we get closer to the Winter Paralympic Games plus start putting in the race pace efforts. Prepping ready for the team's arrival. Cannot wait to see every member giving it 100% and achieve their gold medal whatever that gold medal may be.